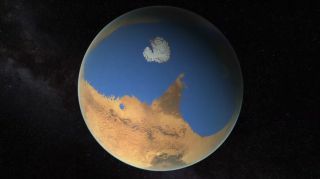 Did Ancient Mars Have Continents? Observations of the Martian atmosphere suggest the Red Planet once had an ocean that covered a fifth of its surface. Most of that water was later lost to space. With the help of a rock-zapping laser, NASA's Mars rover Curiosity has detected Red Planet rocks similar to Earth's oldest continental crust, researchers say. This discovery suggests that ancient Mars may have been more similar to ancient Earth than previously thought, scientists added. Previously, scientists had suggested that the continental crust may be unique to Earth. The silica-rich rock, the idea goes, resulted from complex activity in the planet's interior potentially related to the onset of plate tectonics — when the plates of rock making up Earth's exterior began drifting over the planet's mantle layer. In contrast, analyses of images snapped by Mars-orbiting spacecraft and studies of meteorites from the Red Planet previously suggested that the Martian crust was made up primarily of basaltic rock. Now researchers have found that silica-rich rock much like the continental crust on Earth may be widespread at the site where Curiosity landed on Mars in August 2012. "Mars is supposed to be a basalt-covered world," study lead author Violaine Sautter, a planetary scientist at France's Museum of Natural History in Paris, told Space.com. The findings are "quite a surprise," she added. Sautter and her colleagues analyzed data from 22 rocks probed by Curiosity as the six-wheeled robot wandered ancient terrain near Gale Crater. This 96-mile-wide (154 kilometers) pit formed about 3.6 billion years ago when a meteor slammed into Mars, and the age of the rocks from this area suggests they could help shed light on the earliest period of the Red Planets, scientists said. The 22 rocks the researchers investigated were light-colored, contrasting with the darker basaltic rock found in younger regions on Mars. They probed these rocks using the rock-zapping laser called ChemCamon Curiosity, which analyzes the light emitted by zapped materials to determine the chemistry of Martian rocks. The scientists found these light-colored rocks were rich in silica. A number of these were similar in composition to some of Earth's oldest preserved continental crust. Sautter noted that recent orbiter and rover missions had also spotted isolated occurrences of silica-rich rock. The researchers suggest these silica-rich rocks might be widespread remnants of an ancient crust on Mars that was analogous to Earth's early continental crust and is now mostly buried under basalt. The researchers added that the early geological history of Mars might be much more similar to that of Earth than previously thought. Future research could investigate whether the marked differences between Mars' smooth northern hemisphere and rough, heavily cratered southern hemisphere might be due to plate tectonics, Sautter said. The scientists detailed their findings online Monday (July 13) in the journal Nature Geoscience.